More councils should look at adopting roadwork permit schemes to help cut congestion. 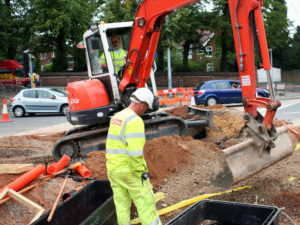 So says the Department for Transport as it publishes new research from Ecorys that shows such schemes – where companies apply to highways authorities to carry out works – can help reduce the length of disruption from roadworks by more than three days. The analysis also showed these schemes cut the number of overrunning roadworks. Introduced in 2010, permit schemes cover works on all local roads and can be complemented by lane rental, where utility companies are charged daily for digging up the busiest roads at peak times – earlier this year, the DfT gave councils the green light to roll out lane charging schemes nationwide later this year, which will see companies charged up to £2,500 a day to carry out works on busy roads. Around 65% of authorities now have roadwork permit schemes in place and the remaining 35% are being asked to introduce them.